Imagine we have an app that collects geo-coded photographs. We give the app to thousands of students and ask them to collect pictures of storefronts, together with the company name and data from the phone’s GPS. Using the latitude and longitude, the company name, and the photograph we intend to crowd-source a business directory. Our app is based on Offline First design principles. It stores its data locally on the mobile device, syncing to the cloud when there is a decent connection. This means our intrepid data collectors need not worry about mobile data charges or visiting areas without cellular coverage — they can still store their data on their smartphones and upload it later. We can use PouchDB for web apps or the Cloudant Sync library for native mobile apps on the client side, and use the IBM Cloudant database service on the server side. This gives us the mobile-to-cloud replication of the business data, including storing the photographs as binary attachments. Storing binary attachments in a NoSQL document database is handy, but it’s not best-practice in the long term. It’s a useful means of storing binary data, especially on the client side when there’s no network connectivity. In the long term, however, object storage is a natural choice to provide a limitless store of files and is much cheaper than a database per GB of binary data. We can implement a best-of-both-worlds approach by storing attachments in the database initially, but detaching them later by moving them to object storage as data reaches the cloud. The _rev field has changed because we have written a new version of the document. The _attachments object is gone. Cloudant is no longer storing the attachment. There is a new attachments object with almost identical data, except that it contains a reference to a Location (the URL describing where the attachment is stored in Object Storage) and a Key (a concatenation of the document id and the original filename). The code to do this runs on IBM Cloud Functions, IBM’s serverless platform which is based on Apache OpenWhisk. A tiny piece of Node.js code is deployed to IBM Cloud Functions and configured to run against every change that occurs in the Cloudant database. 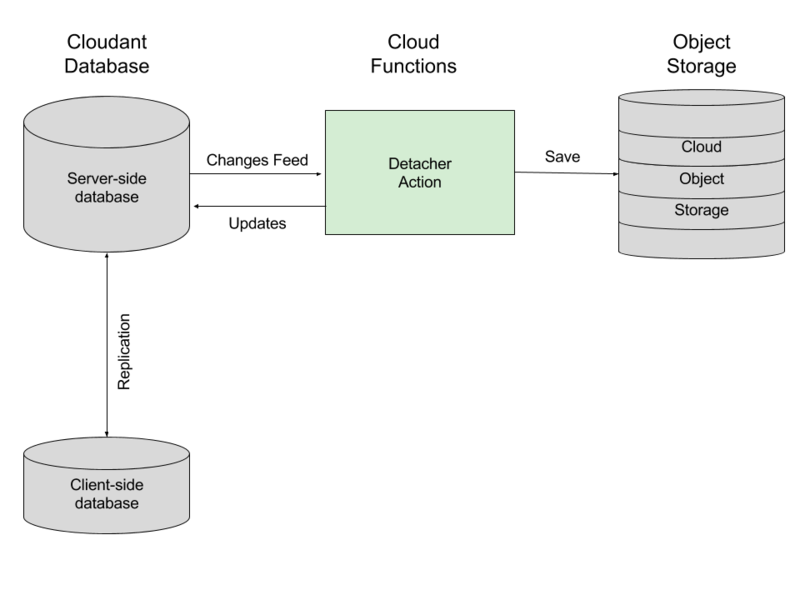 Architecture diagram for the detacher service, centered around a serverless function based on OpenWhisk, running on the IBM Cloud Functions service. How do I deploy this myself? You’ll need a Cloudant account with a database in it, the IBM Cloud Functions command-line tool installed, and an object storage bucket on Amazon S3 or IBM Cloud Object Storage. IBM’s object storage service supports a subset of the S3 API for easy migration. With a couple simple steps, I can use the same code on IBM Cloud Object Storage that I developed for Amazon S3. 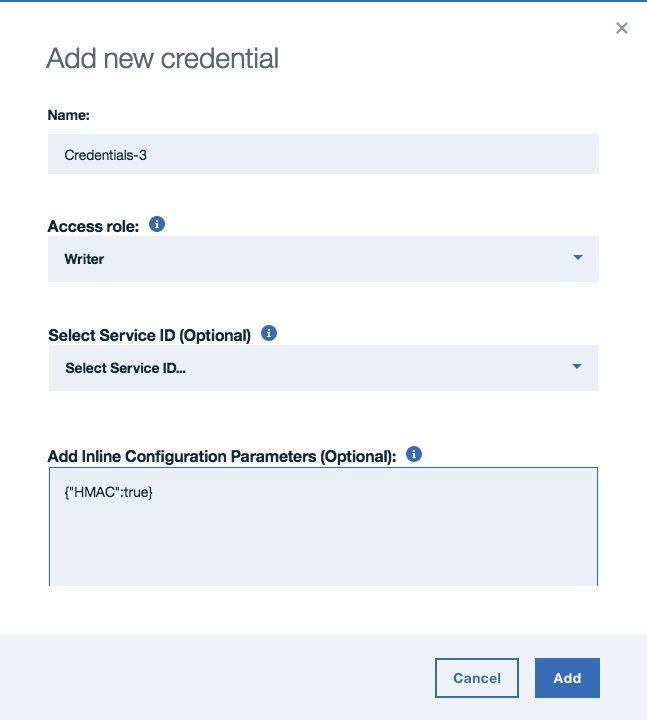 Passing in the HMAC flag when generating your bucket’s credentials will create the “cos_hmac_keys” field containing the S3-style access key ID and secret access key you’ll need in order to run your S3 code against the IBM Cloud. Now every time you create a document with an attachment, the attached files are automatically moved to your object storage bucket in the blink of an eye. Click the image to play the gif. 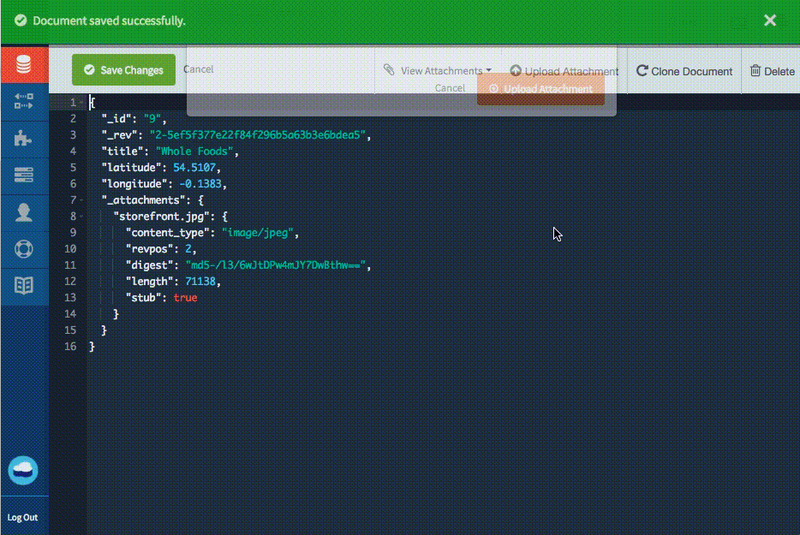 An attachment is saved to a JSON document in Cloudant. Upon refresh, it has been moved to object storage, thanks to detacher listening to the Cloudant _changes feed. Check out the source code for yourself, and start giving those document attachments the treatment they deserve!